Learn how to use the embroidery software that enhances the Baby Lock Solaris Embroidery Machine. This is a machine embroidery software program used to manipulate and digitize embroidery designs. Using this advanced software, you'll create and edit embroidery designs easier than ever before. 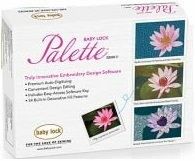 Baby Lock Palette 11 software takes your embroidery machine's capabilities to the next level. You'll enjoy improved functionality that makes every step of digitizing easier. All-new editing features help you perfect your embroidery projects. Bring your laptop and Palette Software Key (program won’t work without it). Check for and install updates before class. An external mouse would be helpful.